I have a hobby problem. Not that I have too many of them, or too few. It's that I fixate on them for months at a time. Recently I've gotten it in my head that I need to become a beekeeper. I have always been fascinated by insects, and always love researching hobbies, so I've spent much of the past winter reading and learning as much as I can. Books from the library, meeting with a local beekeeper, joining a local beekeeping club and frequenting beesource.com, a very popular beekeeping forum--these were all quite helpful in getting me started. And as you might expect, over the course of the winter, I learned a lot about bees. I learned about the different castes of bees--workers, drones and queens--as well as the varied roles of each. At different ages, worker bees have different responsibilities. Throughout a hive, bees also engage in complex communication. Beehives can become very large during the busy summer and fall - a hive may have 50-60,000 individual bees in it, but if the queen bee is killed or leaves, the entire hive will be aware in just a few hours. Bees can tell each other the location of good quality flowers, or incite each other to attack based upon different pheromones they release. As I learn these different bits of knowledge, I'm continually reminded of science fiction. I'm struck by how closely the life-cycle, communication style, and social structure of the bee is mirrored in many representations of alien life. Take, for example, the 1979 film Alien , in which humans are attacked and parasitized by hive-minded aliens, or Ender's Game , in which all humans on Earth are organized in a war against a race of insectile aliens termed 'buggers.' Video games like Shadowgrounds , in which you wage war against invading bug-like aliens, follow in much the same vein as these two classic texts. The plots are certainly more complex than just depicting how evil a hive-style organism is (Ender's empathy with the hive queen at the end of Ender's Game is one example of this complexity), but the prevailing mood of these texts is overwhelmingly one that shows bugs as bad--to the point where I barely remembered the more positive details at the end of Card's novel. What I find most interesting about this is that these works all show the bad aspects of the bee--the danger, the "hive mentality," the complete difference from a human's understanding of existence (if that's really a bad thing). And of course this makes sense-- I mean, who would make a movie about a bunch of aliens making honey? But as a beekeeper, I kind of wish this weren't the case. Bees are hugely important, not only because of their own intrinsic worth as a species, but also to human life. Without the pollination that bees provide, our lives would be drastically different. 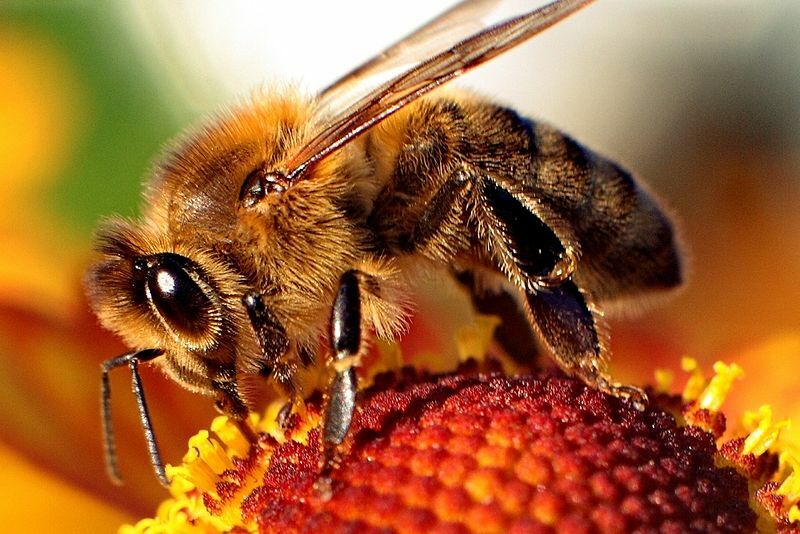 But because bees are so foreign, so alien if you will--and because this is a difference that is played up by science fiction books, films, and video games--the perception of them is that they are dangerous, that they are a threat, and that they should be killed. And of all the things that we could learn from bees, this is the one thing that is definitely not true.